A sidecar isn’t like any other vehicle. The design dates back to pre-WWII technology sharing between the Nazis and Soviet Union and the bikes are still made in the same factory that was located out of bomber range way out on the Siberian steppe. This is what they’re like to ride today. Full Disclosure: I’m friends with Ilya and Madina, the couple that owns Ural, as well as most of their staff. Reading this review, I don’t think you’ll detect any bias and it’s a relationship that’s enabled me to tell some neat stories. Like the time I visited that factory in Siberia for Wired. The first thing that you need to understand about Ural’s bikes is that, compared to modern cars and motorcycles, they’re objectively terrible machines. A big update that rolled out across their model range last year added things like disc brakes to all three wheels, fuel-injection and a hydraulic steering damper. Technology the rest of the motorcycle world got in the 1980s. This transformed the machines from freakin’ terrifying to something you’d only describe as moderately dangerous. I’ve had one big crash on a Ural. Riding off-road through California’s San Gabriel Mountains, I flew over a blind crest expecting an uphill left hander to come next, but instead discovered a downhill, decreasing radius right. This was a big problem because a sidecar handles fundamentally differently depending on which direction you’re turning. With the car mounted on the bike’s right side, a left hand turn will push it into the ground, leading to incredible stability and easy slides. Turn right, however, and the car lifts off the ground, potentially flipping the entire contraption on top of you. I ended up snapping my left wrist in half at the end of an old metal plate that used to be in there, then found a doctor who, because it was a weekend, didn’t have access to pain killers, but who snapped my bones back into place anyways. Ouch. The bike didn’t fare well either. In the crash, I managed to ram the bike into a huge log, pushing the front wheel into the engine and bending the front suspension. Luckily, they were designed to be easy to fix. Ural shipped down a complete new front end, my friends threw it into a pickup, drove out to the mountains, swapped the parts and rode the sidecar home, good as new. I guess if you design a bike to withstand mechanized warfare during the Russian winter, it can stand up to whatever abuse some dog-camping journalist can throw at it. The basic design of this bike dates back to the civilian BMW R71 of the 1930s. Plans for that bike were shared by Germany with the Soviet Union as part of the Molotov-Ribbentrop pact of 1939, at which point Soviet engineers set out to beef it up for the rigors of use by their army and to simplify its production. It ended up becoming their equivalent of the Willy’s Jeep, moving men and materials through mud and snow and even taking the fight straight to the Nazis with a machine gun mounted to the car. It was so important to the war effort, in fact, that the factory was moved to Irbit, a town in Siberia 2,000km east of Moscow and well out of range for German bombers. That of course creates some interesting problems today; the factory is twice as close to Astana, the capital of Kazakhstan, than it is to Moscow. And don’t even think about access to sea ports. Over the subsequent seven decades, the machines grew from 650 to 750cc and had various small tweaks and upgrades made. But, the company was not invested in and, after the proletariat gained access to actual automobiles with actual roofs post-communism, no one in Russia wanted sidecars anymore. So, early last decade, Ilya was able to purchase Ural and transform its focus from utilitarian transportation to chasing western adventurers. 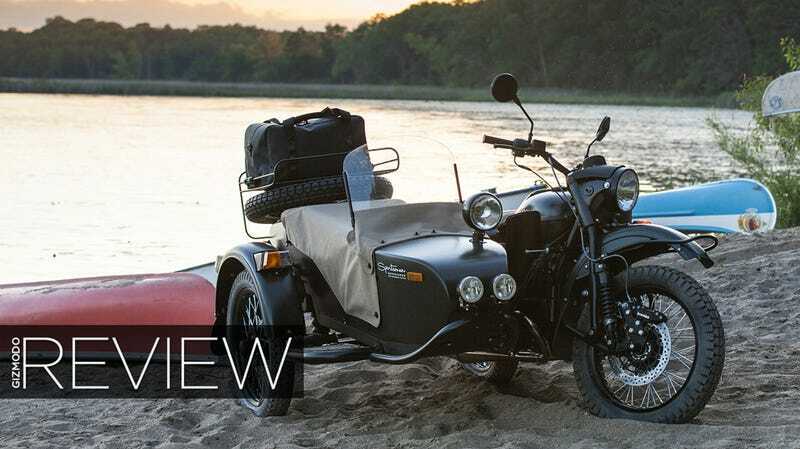 Ural now makes several versions of its sidecar, some with one-wheel drive, intended mostly for road use, and some with two-wheel drive, which will go pretty much anywhere, including through deep snow that would easily stop most four-wheeled off-roaders. The bike you see here is the ($15,599) Patrol, a 2WD motel optimized for long-distance adventuring with a passenger. So, it gets a windscreen on the sidecar and a little cloth fairing that should also help keep the weather off them. On top of that base model, this is the 2015 Special Edition “Sportsman Camp Wandawega Edition,” which adds black paint, LED running lights on the car and a nice waterproof bag that clips to the rear luggage rack. More on Camp Wandawega later this week, it’s a neat place in Wisconsin. This is not a motorcycle, it is not an ATV and it is not a car. It takes what’s difficult about each of those and combines them into one, exceptionally challenging vehicle. You steer a motorcycle (or bicycle) by turning the handlebars away from a corner, initiating roll into the corner. You steer an ATV by turning the handlebars towards a corner. Most of the time, a sidecar works like that ATV but, lift the car off the ground in a right-hand turn, and suddenly you start steering like a motorcycle — the opposite way. If that doesn’t sound crazy enough, the presence of a giant, heavy sidecar hanging off the right side makes things even worse. Motorcycles are inherently stable vehicles, with the gyroscopic force of the two, inline wheels working to keep them upright and tracking straight with remarkably little human involvement. Throw a third wheel on the right side and rest a metal bathtub on top of it and that stability goes down the drain. When you accelerate, the tub/car/chair/whatever you want to call it lags behind. Because it’s dragging backwards on the right side, the whole contraption then wants to yaw to the right. Slow down either by rolling off the throttle or by applying the brakes and that heavy car wants to keep traveling forward, causing the entire contraption to yaw left. Controls are identical to a motorcycle — hand throttle and front brake on the right bar, clutch on the left, your left foot shifts gears sequentially and your right foot operates the back brakes. Yes, I did use the plural from of back brake, there’s now a disc on both back wheels and adjusting their proportion is important to tuning the handling of the bike. But, you’re not riding a nice, slim motorcycle. The Patrol is 5.3 feet wide, with most of that off to your right side. Riding down the road, you have to constantly remind yourself not to let the right wheel run into guard rails, fire hydrants, lamp posts, cyclists and pedestrians. Sounds like a lot to keep track of, right? It is, but there’s also one last problem: this thing is slow. Now with fuel injection, the 750cc boxer twin makes 41bhp and 42lb-ft of torque. That’s not a lot and it has to motivate 730lbs (dry). As an illustrating aside about weight, that’s 225lbs heavier than one of those giant BMW R1200GS adventure bikes you see riding around the world. But, even with an all-metal sidecar, third wheel, luggage rack, spare tire, shovel and a 5-gallon jerry can (empty) it’s also 30lbs less than Harley’s lightest touring bike, the Road King. The maximum sustained cruising speed is about 70mph and you’ll have to work to maintain that on long, uphill sections of highway. The tradeoff for tractor-like performance is a low-speed capability through soft surfaces like deep snow or mud is also positively tractor-like. Seriously, I once rode one of these across a Russian field covered with three feet of fresh, wet snow. With the rear differential locked, the front wheel acted like a rudder and I just plowed my way through it without effort or drama. The only other wheeled vehicle I can think of that wouldn’t have gotten stuck would be that tractor, but once out of that field, I just got on the highway again and rode home; no tractor will do that. You can take your dog along for the ride. And all your camping gear. The sidecar itself is spacious and comes with a generous, lockable, waterproof trunk. The included tool kit is the most comprehensive I’ve seen on any vehicle sold in 2015. It’s everything you need to dismantle, fix and reassemble any part of the bike. That’s probably a good thing; you’ll need it. The hydraulic steering damper has cured the sidecars previously terrifying speed wobbles; it now travels in more or less a straight line. You will never get the 2WD model stuck, ever. Not only can it crawl through anything with that locking diff, but it’s light enough that you and maybe one other person can push or pull it out of a ditch if necessary. I’ve done exactly that. With a shovel, jerry can and spare wheel mounted to the side, this is the only vehicle that comes stock with all the tools you need for serious off-roading in remote locations. Braking power is now adequate, predictable, fade free and easily adjustable. Thank you discs. Performance is better than the numbers indicate; the torque curve is essentially flat from idle to redline. As exposed as a motorcycle, as flippable as an ATV and as subject to traffic and parking issues as a car. No ABS and no stability control, no seatbelt. Your life is literally in your own hands. Poses a real challenge for riders that’s much greater than even that of a very fast motorcycle. But isn’t fast. At all. Requires a motorcycle license in most states. Producing something in rural Siberia, mostly by hand, then shipping it thousands of miles by train to be loaded onto a boat and then travel across an ocean is not a recipe for a cheap price. Despite their basic, antiquated nature and limited performance, these things are expensive. Scar by Aprilia RSV4, curvy wrist by WWII-era Soviet sidecar, bow burn by PSE. So here’s the thing. Everything I’ve described about how limited and difficult and dangerous these things are actually adds up to what makes them such charming, unforgettable experiences. Do easy-to-drive, but utterly anodyne modern cars leave you cold? Do you like the sound of riding something made to do battle during WWII? Is the carrying capacity of motorcycles too limited? Do you have a dog? Does the ability to mount a machine gun to the sidecar sound like an intriguing opportunity? Do you like traveling to remote parts of the world where roads don’t go? Do you want to ride in the snow? Then yeah, you’re going to want a Ural. Just be careful!